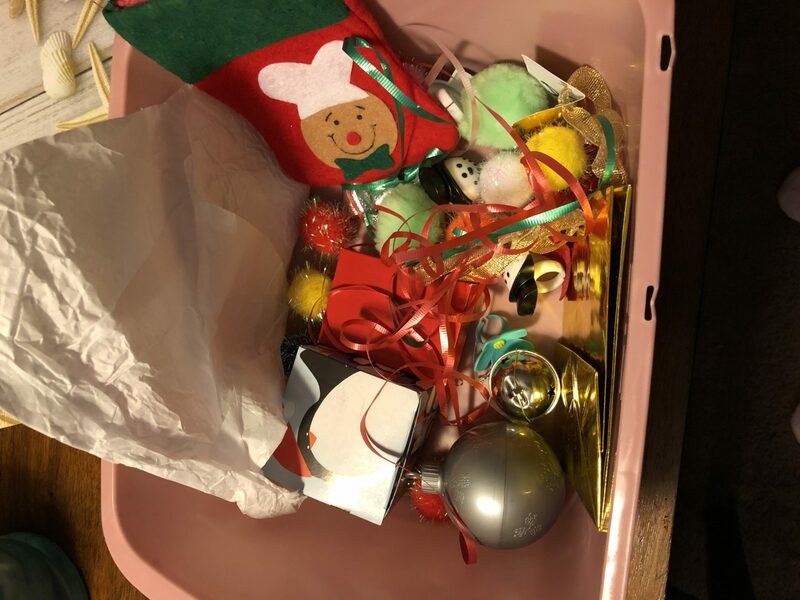 This week, I decided to make up a festive sensory tub for Rosebud. I’m calling it the gift giving sensory tub. Today was the first time Rosebud got to play with this tub and she played for almost an hour. I had to tare her away for bath time. She loved filling the gift bag, putting the items in the different sized boxes and trying to wrap them. We pretended to give each other gifts. She’d open a box of snowman rings and say, “thank you Mommy. This was the best gift ever.” Then I’d open a gift bag full of pompoms and tell her what a nice gift she gave. If you are working on sharing and kindness, this would be a great sensory tub for the theme. We worked on math skills by counting the number of pompoms in a box. We used our listening skills to guess what was inside the boxes. We discovered that we can always tell when one of the bells were in the boxes, but we could only hear the pompoms depending on the size and style of the box. Rosebud folded wrapping paper and tried to tie ribbon to practice those fine motor skills. If your child is a little older, you could include tape so they could practice actually wrapping presents. I did not include tape because I knew it’d be everywhere. I’d love to add more ribbon of different sizes, other Christmas and winter themed trinkets for a wider variety of gifts and child scissors to cut wrapping paper. 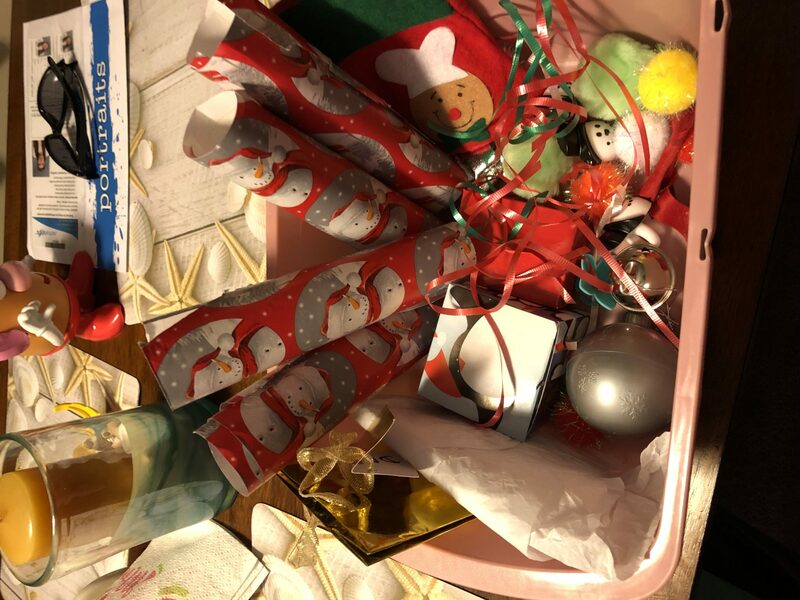 If you’ve tried something similar or have a festive sensory tub of your own, tell me in the comments. I’m always looking for good sensory bins. This one is great for this time of year! Thanks. I’m glad you liked the idea. Thanks for your comment. What a great idea for the holidays! My son loves exploring and touching things. He would love this. Thank you! That is one reason why I posted this tub. My daughter loves just putting things in different boxes and bags. Children can have so much fun playing with the most basic things. Thank your for commenting. I love this! Children can play for hours with ordinary things and you even turned it into a learning experience as well as sensory activity! I was taking care of my niece this morning that is 10 months old and this would have been way more fun then some kitchen dishes. I’m glad you enjoyed the idea. I’m always looking for ways to repurpose ordinary household objects into play opportunities. Thank you for your comment. My daughter loves sensory bins. Even though we don’t do Christmas this helps give ideas to make one! Thanks for sharing! You’re welcome. Glad you liked the idea. 🙂 Thanks for commenting. Great idea. I will remember this when my daughter wants to help, but is really getting in the way! That’s a great idea to keep her occupied when you have to wrap presents. Thank you for commenting.